The Bois de Boulogne is a large public park located along the western edge of the 16th arrondissement of Paris, near the suburb of Boulogne-Billancourt and Neuilly-sur-Seine. The land was ceded to the city of Paris by the Emperor Napoleon III to be turned into a public park in 1852. It is the second-largest park in Paris, slightly smaller than the Bois de Vincennes on the eastern side of the city. It covers an area of 845 hectares (2088 acres), which is about two and a half times the area of Central Park in New York and slightly less (88%) than that of Richmond Park in London. Within the boundaries of the Bois de Boulogne are an English landscape garden with several lakes and a cascade; two smaller botanical and landscape gardens, the Château de Bagatelle and the Pré-Catelan; a zoo and amusement park in the Jardin d'Acclimatation; GoodPlanet Foundation's Domaine de Longchamp dedicated to ecology and humanism, The Jardin des Serres d'Auteuil, a complex of greenhouses holding a hundred thousand plants; two tracks for horse racing, the Hippodrome de Longchamp and the Auteuil Hippodrome; a tennis stadium where the French Open tennis tournament is held each year, the Fondation Louis Vuitton and other attractions. 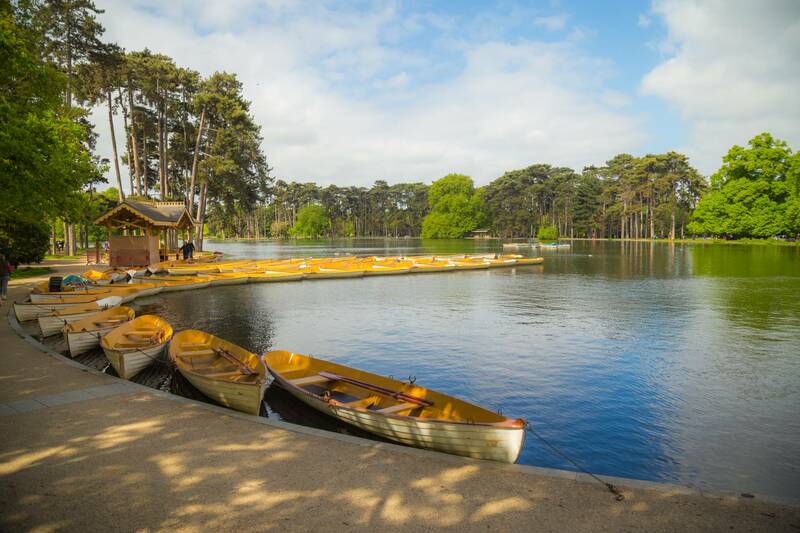 On weekends, the Bois de Boulogne is full of activities such as biking, jogging, boat rowing, horseback and pony rides, and remote control speed boats. Picnics are permitted in most parts of the park, but barbecues are not allowed. The Bois de Boulogne hosts several races, like the 10 km (6.2 mi) of Boulogne and the Boulogne half marathon. Since its creation, the last part of the Paris marathon ends by crossing the Bois de Boulogne from 35 km (22 mi). Boulogne Wood is an important place of running in Paris. The Bois holds a three-day weekend party in the month of July, with over 50 bands and singers, attended mostly by students who camp out overnight. Though soliciting for prostitution is illegal in France, at nighttime parts of the Bois de Boulogne are a popular rendezvous place for prostitutes, usually working in vans parked by the side of the road. The French government has been trying to eliminate this business from the park. The Bois de Boulogne contains two artificial lakes and eight artificial ponds, connected by three artificial streams. They receive their water from a canal drawn from Ourq River and from artesian wells in Passy. The water arrives in the Lac Superieur (Upper Lake), built in 1852 and located near the Hippodrome de Auteil, then flows by gravity to the Grand Cascade and then to the Lac Inferieur, or Lower Lake. The Lac Inferieur (1853) is the largest lake in the park, near the large lawns of Muette. The area is very popular with joggers, and boats can be rented on the lower lake from 15 February to the end of October. The lake is the home to many swans and ducks. An island in the lake, accessible by boat, contains the city's only monument to the Park's builder, Napoleon III; a small wooden kiosk at the end of the island, called the Kiosk of the Emperor. The Grand Cascade (1856) was built out of four thousand cubic meters of rocks from Fontainebleau, and two thousand cubic meters of cement. In addition to the picturesque waterfall, it has two artificial grottoes. one over the other, which can be visited. The Etang de Reservoir holds the water before it falls in the Grand Cascade. The Ruisseau de Longchamp (1855) is the major artificial stream in the park. It flows through the Pré-Catelan, under the alley of Reine Marguerite, then to the Mare des Biches, one of the oldest natural ponds in the park, then to the Etang de Reservoir and the Grand Cascade. The Mare de Saint-James is located next to the Jardin d'Acclimatation, and was formerly a quarry for sand and gravel. It has two islands which are a sanctuary for birds and small animals. Within the Bois de Boulogne, there are several separate botanical and floral gardens, and gardens of amusement. The Château de Bagatelle. Following the French Revolution, the miniature chateau and English landscape garden of the Bagatelle was restored to the Bourbon family. They sold it in 1835 to an English nobleman, Francis Seymour-Conway, 3rd Marquess of Hertford. It remained separate and outside the Bois de Boulogne until 1905, when it was purchased by the City of Paris and attached to the park. The garden was enlarged and redesigned by Jean-Claude Nicolas Forestier, the new Superintendent of Parks of Paris, a pupil of Alphand. He preserved many elements of the old garden, and added sections of botantical garden, including an iris garden and a pond for Nymphaeaceae, or water lilies, popularized at the time by the paintings of Claude Monet. He also built one of the most popular features of the Bagatelle today, the rose garden. The rose garden today has more than nine thousand plants, and is the site of the Concours international de roses nouvelles de Bagatelle, held each June, one of the major competitions of new roses in the world. Since 1983, the Festival of Chopin in Paris is held in the Orangerie, next to the rose garden. The garden also hosts regular exhibits of sculpture and art. The Jardin d'Acclimatation, opened in 1860 as a zoo and pleasure garden, still has many of the traditional features of a children's amusement park, including an archery range, a miniature train ride, pony ride and Guignol puppet theater, but it underwent several changes in its theme in the last decade. A science museum for children, the Exploradome, opened in 1999. It also now includes a section with an Asian theme, with a teahouse, a lacquered bridge, and a Korean garden. In October 2014, a major new museum opened, the Louis Vuitton Foundation, in a building designed by architect Frank Gehry. The Jardin des Serres d'Auteuil is a large complex of greenhouses in the southern part of the park. They stand on the site of a botanical garden founded in 1761 by King Louis XV. The present greenhouses were built in 1895-98, and now house about one hundred thousand plants. In 1998 the greenhouses officially became part of the Botanical Garden in Paris, which also includes the Bagatelle in the Bois de Boulogne and the Parc Floral de Paris and the Arboretum de l'Ecole de Breuil in the Bois de Vincennes. The Pré-Catelan still has a few vestiges of its early days; a majestic copper beech planted in 1782; a giant sequoia tree planted in 1872; the old buffet built by Gabriel Davioud; the grand restaurant built by Guillaume Tronchet in 1905; and the Shakespeare Garden, created in 1953 on the site of the old floral theater. Five different natural settings contain all of the trees, bushes and flowers mentioned in Shakespeare's plays. The Hippodrome de Longchamp, opened in 1857, is built on the site of the old Abbey of Longchamp. A restored windmill, the only building left of the Abbey, is located on the grounds of the track. The major annual racing event at the Hippodrome de Longchamp is the Prix de l'Arc de Triomphe, held every October. The Auteuil Hippodrome, covering 33 hectares, opened in 1873. It is used exclusively for steeplechase racing. The Stade Roland Garros is a tennis complex which hosts the annual French Open tournament in early June. It was opened in 1928 for the first defense of the Davis Cup tennis tournament, and is named for the French aviator Roland Garros, who was the first pilot to fly solo across the Mediterranean and a First World War ace. The 8.5 hectare complex has twenty courts. The famous red clay courts are actually made of white limestone, dusted with a few millimeters of powdered red brick dust. 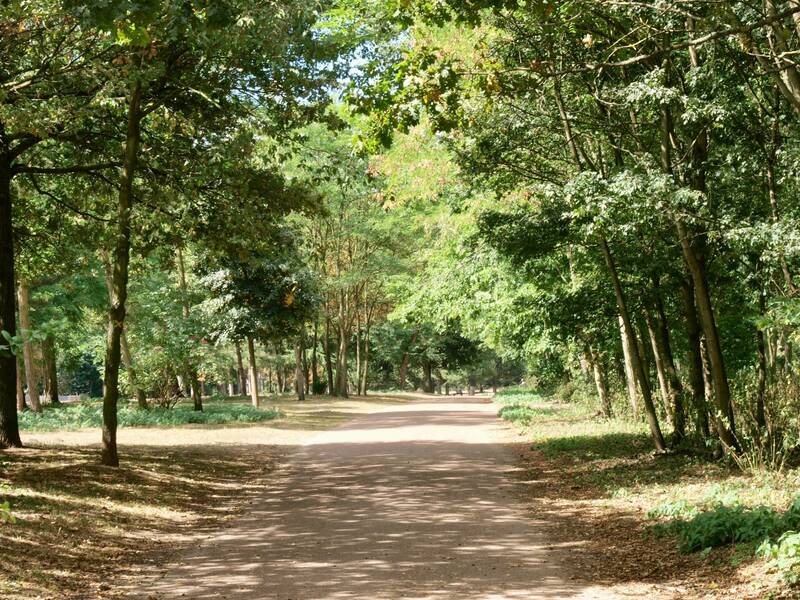 There is a seven-hectare campground in the Bois de Boulogne, Camping Indigo Paris, with five hundred and ten sites ("pitches") for travelers with tents, caravans and camping cars. Reservations can be made in advance, on-line. Mobile home rentals are also available by reservation. Bois de Boulogne | eTips Inc.